Will Gun Control Fix It? Make America Safe Again. It’s amazing how much debate we’re hearing on gun control after the horrific Las Vegas killing and now the attack in Sutherland Springs. Considering that guns make up a small percentage of the weapons used to kill people, it’s a shame that people don’t talk about airplane control, vehicle control, or knife control. What most people fail to realize is that it’s not about the gun, the airplane, the knife, the vehicle, or the bomb. It’s about the person. It’s about the person! If people don’t have guns to shoot at people, or vehicles to drive into crowds, or planes to crash into buildings, they will come up with some other way to kill, because the question is not about what they use or how they use it. The question is why they kill. People are committing these acts of violence because they are evil people. We are evil people because we have a sin nature. Until we reconcile this, no piece of legislation, no law, no person in the private sector, or in the government sector will be able to help us! The only person that can change us is God! Unless we embrace the idea that people have sin natures, we will eventually isolate all humanity to a room where a person is medicated and restrained from every and all things that could be harmful to other people and to ourselves. If we were all doctors, there would’ve been a malpractice suit long ago. For years we have misdiagnosed the problem! The problem has never been with what comes out of man – the problem has always been what lies within. As is usually true, a misdiagnosis results in a mistreatment. While the symptoms of evil can manifest themselves externally, the real problem is internal. The solution to right living always begins by right thinking! Before a person ever did a heinous crime, they thought it in their mind. Treatment should begin within a person, and our goal should be to teach people what and how to think. If you tell a person what to think, you help him for a day. If you teach him how to think, you help him for a lifetime. When International Women’s Day began in 1909, it was largely about a woman’s right to vote and equal pay. I admit that women have not always had the same rights as men. It is a great thing that we can vote today, and I am glad that people fought for my right to have a say in our government. Today the stakes are different. I don’t believe that women (at least in this country) are fighting for equal rights; we have equal rights. The Declaration states it so beautifully, “We hold these truths to be self-evident, that all men are created equal, that they are endowed by their Creator with certain unalienable Rights, that among these are Life, Liberty and the pursuit of Happiness.” This is speaking about mankind (that means all of us) regardless of gender or race. I don’t need to fight for equal rights – I already have them. First, they are given to me by God, and secondly, they are upheld by the Constitution of the United States of America. As a woman, I can choose to be anything I want to be. Just like every person in this country, I have a choice in what job I want, what home I buy, where I live and the lifestyle I lead. So often we act like we have no options. A wise man once told me, “The choices you make will turn around and make you.” If you don’t like where you are in life, make a different choice, but stop blaming it on the lack of women’s rights. If your job isn’t paying you enough or you’re not happy with your living situation, take the steps you need to take (whether it’s more education, a job change, a move) to change your situation. We cannot always have everything we want in life. If I want to sit at home on the couch and do nothing, I can, but if I also want to be rich, the two are not compatible. Women have been told they can have everything, but this is simply not true. We all have choices – and the decisions we make will result in various outcomes. This is not a double standard for women, this is a fact of life for every human alive. As a woman, I have many things pulling at me for attention; however, I choose to prioritize certain things above others. I am a Christian, a pastor’s wife, a mother, a tutor – these titles come with certain responsibilities. On any given day, I can prioritize one above the other. If I choose to prioritize motherhood over my job, then I will not receive as much pay as someone who puts their job first. We need to stop acting as if we don’t have a choice. I make choices every day based on what I want out of life; those choices have consequences, and that is ok. When I heard about the “Day Without a Woman,” my first thought was that I can’t understand how going on strike helps women. I believe it weakens us as women. I have students who need me to help them read, laundry that needs to be done, a family that needs to be fed, a church website to update, children to take to the dentist, etc. If I choose to strike, just to show others what a day without me would be like, I am proving to the world that I am selfish and only think about myself. My husband and I are a team. He helps me with the kids, he counts on me, he appreciates me, and he knows that he would struggle to do everything without me. My students’ parents are counting on me to teach their children reading. How selfish to strike so that everyone can see how important I think I am! There are plenty of times that the laundry doesn’t get done, I feed everyone fast food, and I must cancel one of my tutoring sessions, but it is because of a conflict, not because I need to feel appreciated. I think it is incredibly hypocritical for women in this country to parade around acting as if we have it so bad. We have it better than any generation before us, and better than most women around the world. There are countries that I have visited where women are still put to death when their husband dies. National Geographic just published a story on widows in other countries whose entire livelihood is tied to their husband. Women’s rights are so much more than reproduction and abortion. There are real atrocities happening to women around the world, and we have no clue how good we have it as American women. The theme for International Women’s Day 2017 is #BeBoldForChange. The plight of women around the world is not going to be improved because some middle-class American women wore red and refused to work for the day. Change happens when people show up. If you believe that changes need to happen, get to work! As an American woman, I have a great life, full of opportunity and choices. I am blessed to live in a country whose rule of law, the Constitution, guarantees my equal rights and freedom. May we never take for granted the liberty and rights that we enjoy as Americans! Why is the Collective Bargaining Bill such a big deal? As I have jumped into my spot here at Scott County Republicans, the buzz has been about the collective bargaining bill. Of course, once again the Republicans are painted as people who want their fellow humans to starve. What is our problem? Why is this bill such a big deal? First things first, this collective bargaining agreement has not been changed since 1974. Can’t we all admit that things have changed since then? I think it is probably time to look at it with fresh eyes. What has changed with this new bill? Before, if the contract negotiation went to arbitration, it went to an unelected arbitrator to choose one of the two numbers. That person couldn’t choose something in between that was a compromise for each party; he had to choose one number or the other regardless of the outcome to taxpayers. The new bill requires the arbitrator to consider the ability of the employer to finance the wage hike. Imagine that! There is also a provision in this new bill which separates public safety employees from non-public safety employees. The men and women who put their lives on the line to keep us safe every day will still be able to bargain collectively, if we can make their lives a little easier and less stressful, we should. Under this new bill, public workers will also have to vote every two years for the union that represents them. I have to vote every few years for the people who represent me in government. The people in these unions should have an active voice in who represents them in these negotiations. These seem to be the areas that everyone is most concerned about, so why is this bill so important? This is about being a good steward of the resources that God has given us. We have a right to expect great work for great pay, and we need to reward the people who are outstanding and fire the ones who are not. This will create a competitive workplace and give us the best workers in the country. We do not mind paying for quality, but we have the right to demand quality. We don’t want to take away anyone’s healthcare or great work environment, we just believe it should be comparable to ours. DES MOINES – All 15 announced presidential campaigns will joined the Iowa GOP at #United Iowa event, a testament to their joint commitment to elect a Republican president in 2016. Chairman Kaufmann will lead a door knock in the Cedar Rapids area following the rally. Door knocking teams will also be dispatched from the Iowa GOP’s offices in Sioux City, Des Moines, and Ottumwa. United Iowa is a coalition of Iowa Republicans who have pledged to unite and work together to elect a conservative to the White House in 2016. DES MOINES – Iowa’s unemployment rate dropped to 3.7% last month, the 5th lowest in America, as Governor Branstad’s leadership gives businesses the confidence they need to invest in our state. CEDAR RAPIDS, IA (CBS2/FOX28) – More and more Iowans are getting to work. New numbers out from Iowa Workforce Development show Iowa’s unemployment rate dropped last month to 3.7%; down from 3.8% in May. At this time last year, 4.4% of Iowans were unemployed. “For the fourth time this year, the unemployment rate is down,” said Iowa Workforce Development Director Beth Townsend. “As the low unemployment trend continues, encouraging gains are being seen in the retail sector; the business establishment survey added 3,000 retail jobs this month.” Iowa is also ahead of the national unemployment rate of 5.3%. 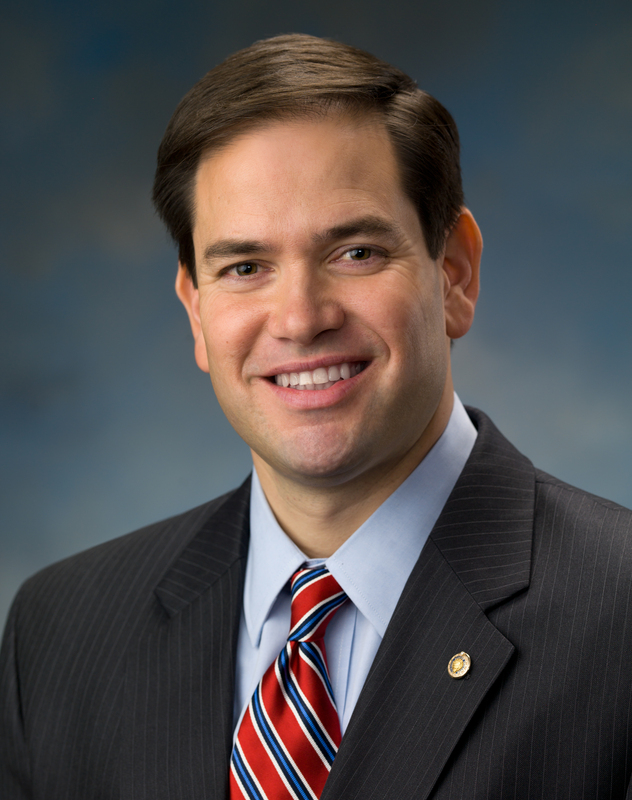 Another presidential candidate visits Scott County next week! No charge to attend, and open to the public. DES MOINES – The Republican Party of Iowa’s State Central Committee voted today to cancel the 2015 Iowa Straw Poll, previously planned for August 8. The final vote was unanimous to cancel the event. only hold a straw poll if the candidates wanted one, and this year that is just not the case. For that reason I called a special meeting to update the State Central Committee, which then voted unanimously this morning to cancel the event. This step, while extremely distasteful for those of us who love the Straw Poll, is necessary to strengthen our First in the Nation status and ensure our future nominee has the best chance possible to take back the White House in 2016. Through the whole process we’ve listened to Iowa activists and our Republican candidates. We listened in January when a groundswell of support prompted the Central Committee to continue the decades-old tradition. We listened when we moved the Straw Poll location from Ames to Boone to lower costs. We listened when we passed those savings on to our candidates by getting rid of the expensive lot auction and reduced costs even further by planning to bring more outside food vendors. Now, we’re listening again. Many candidates are still concerned about participating in an event that carries significant media-driven expectations well ahead of our First in the Nation Caucuses. While we still deeply believe that the Straw Poll offers a fantastic opportunity for candidates, we need to focus on strengthening our First in the Nation status and putting a Republican back in the White House. Canceling the event is not a decision anyone on the State Central Committee took lightly, and I commend them for the thorough, thoughtful job they’ve done. Iowa is First in the Nation because of our strong grassroots tradition and because we believe in a process that gives equal chance to all candidates. We also believe in hosting a process that puts our candidates in the best position possible to win the White House in 2016. Friday afternoon the Iowa House adjourned for the year, closing the books on the 2015 legislative session. I’d like to thank all of you who took the time to send me emails, called my office and sent letters expressing your support or opposition to pieces of legislation. I am always appreciative of your feedback and thoughts. During the interim, please feel free to contact me at kraig.paulsen@legis.iowa.govor call my office at (515) 281-3521. Also visit www.iowahouserepublicans.com for constant updates and articles. 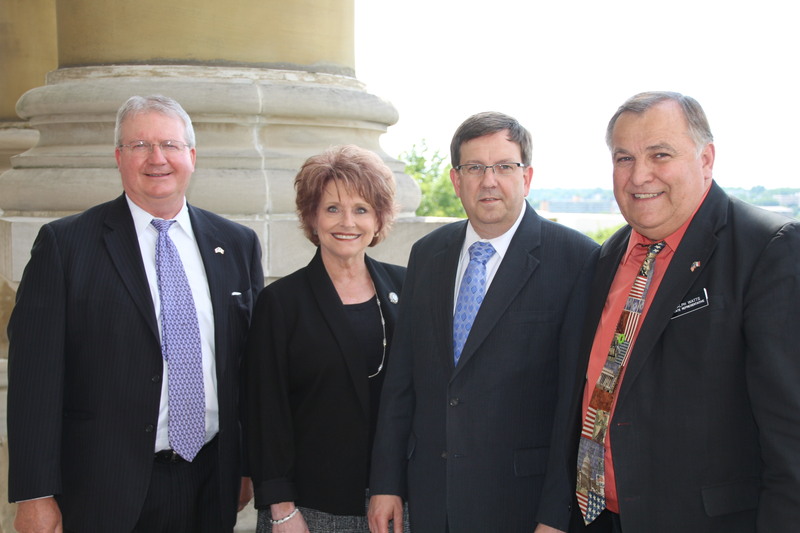 Pictured here on the last day of the 2015 session with the three House Republican legislators who were sworn in with me in 2002: Rep. Tom Sands (Wapello), House Majority Leader Linda Upmeyer (Clear Lake), me, and Rep. Ralph Watts (Adel). I know this took a little bit longer than all of us wanted, but we should be proud that rather than rushing to an end, we did quality work on behalf of Iowans. I’d like to start by quickly thanking you, the members of the eighty-sixth general assembly for your hard work and willingness to come together to do what’s best for Iowans. It is truly an honor to serve as your speaker. Thanks to my page Aaron, you’ve been a tremendous help in our office this year. To the House Republicans – you have shown willingness to do what is right and responsible for Iowa taxpayers, even in the face of great pressure to expand government just to hurry the process. It’s an honor to be a part of your caucus. To my wife, Cathy, and our children, thank you for your constant support and understanding. I want to thank our great leadership team that I am honored to work with – Reps. Fry, Hagenow, Hein, Klein, Rogers, and – I appreciate your leadership and dedication to the Republican caucus. To Speaker Pro Tem Matt Windschitl, your work on behalf of this chamber is significant. To the Majority Leader, Linda Upmeyer, thank you for your unwavering commitment to our caucus and Iowans. I value your friendship and appreciate your tireless work. To Leader Smith and the minority party, thank you for your efforts this year. To our leadership staff: Louis, Terri, Josie, Angie, and Tony. And, in my opinion, the best caucus staff in the building – the House Republican Caucus staff: Jeff, Lew, Brad, Jason, Kristi, Carrie, Colin, Amanda, Dane and Brittany – you are not thanked enough for the work that you do and the service you provide. We are very appreciative. Chief Clerk Boal, thank you to you and your staff, the work you all do to make this chamber operate efficiently. And LSA for all of your hard work, much of what you do is not seen but it does not go unnoticed. And finally, thanks to Governor Terry Branstad and Lieutenant Governor Kim Reynolds and their team for their willingness to once again work together to move Iowa forward. For the fifth year in a row, the Iowa Legislature has made a serious commitment to Iowans to not spend more than the state takes in. This is an incredibly significant accomplishment. Why do House Republicans fight so hard to maintain our budget principles? Because Iowans work so hard to earn that money and we have a responsibility to protect the taxpayers and families who go to work, play by the rules and pay their taxes. Those Iowans expect to be treated with respect. That is why House Republicans will stand up and protect their money every day. Every dollar the Legislature spends that it doesn’t have puts the financial security of those taxpayers and families in jeopardy. Responsible budgeting ensures Iowa’s most vulnerable citizens have resources they can depend on next year and the year after. Keeping spending aligned with revenues will be our first priority of the 2016 session. We are nearing a tipping point in the budget process where Medicaid is consuming resources that in the past have gone to education. The work we did this year on the cost containment measures will be vital to the ongoing stability of our state’s resources. But the challenge does not end there. We must continue to find other ways to effectively manage state dollars. We’ll be back next year to continue our work on giving school districts more flexibility and also on making the case that reform to Iowa’s collective bargaining laws protects Iowans’ money and helps critical dollars actually reach our kids. This session we took a bold stand with Iowa landowners to fiercely protect their property. And lastly, we added some of the most substantial pro-life language to Iowa law in over a decade. Regrettably, this General Assembly could not come together to advance second amendment rights for Iowans and our law enforcement community. It is something we will continue to push for next session. This is no small checklist. We took Iowans’ priorities and turned them into realities by working together and finding common ground. We gave them results, and we’ll be back next year to fight for them again. 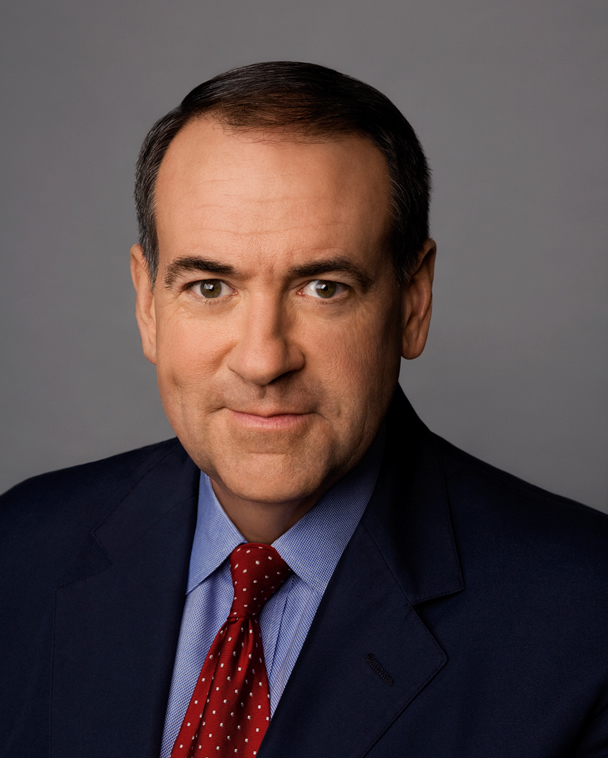 Governor Mike Huckabee invites you to join him this Saturday for a “Meet and Greet” at Thunder Bay Grille in Davenport. U.S. 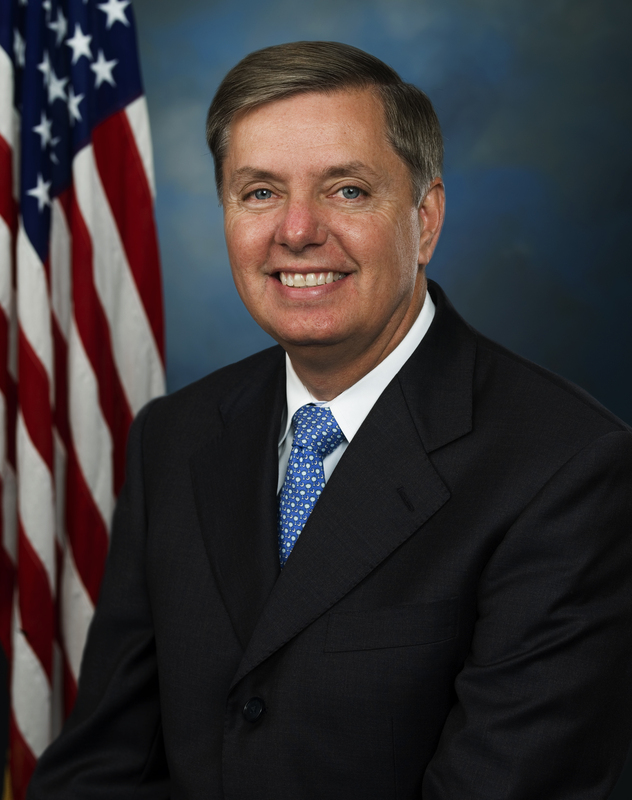 Senator Lindsey Graham to make remarks to the 94th Annual VFW State Convention as a part of his announcement tour! No charge to attend and open to the public.